(a) Personal kit for a week's camp. (b) Personal kit for a weekend hike. (c) The equipment, rations and menu for a weekend Patrol camp. (d) Demonstrate the packing of your kit in a rucksack. 2. Know the principle points to look for when selecting a Patrol or troop campsite and describe with a rough plan how you would lay out the camp with relation to tents, kitchen, sanitation etc. 3. 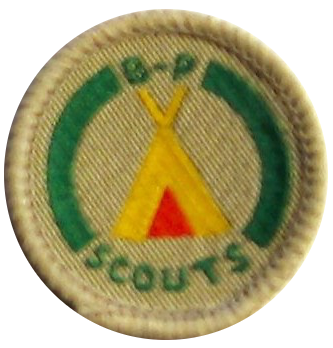 Have a knowledge of the B-PSA Camping Handbook. 4. Make and show the following knots in use: Slip reef, Double sheet bend, Figure of eight, Bowline on a bight and Sheepshank. 5. Pitch, strike and pack a Patrol tent. Storm lash a Patrol tent and show you can carry out simple tent repairs. 6. Show a knowledge of methods of waste disposal and hygiene at camp. 7. Whilst living in camp, cook all meals for yourself for 24 hours and make satisfactory arrangements for the storage of food. 8. Have camped under canvas with a Troop or Patrol for not less than 15 nights.